Check Out Our New 10 Line Horse Racing Scratch Off Cards! 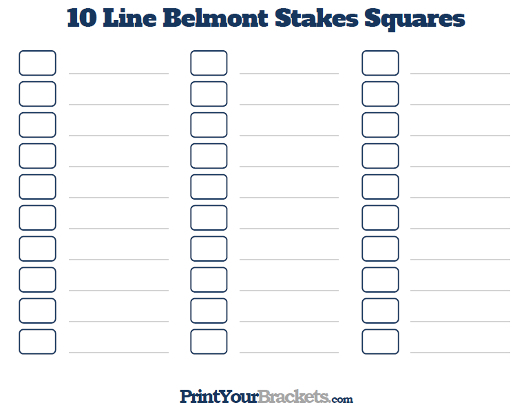 Below is our 10 Line Belmont Stakes Office Pool. The print-out below allows you to run 3 different 10 Line Pools on the same sheet, it's also available as one game per sheet. Simply have the participants of the pool write their name on the line or lines of their choice. Once the 10 lines are full, randomly draw the numbers 0-9 and place them in the boxes beside each line. 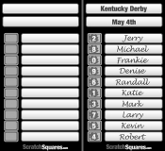 To determine a winning square you will use the Post Position of the winning horse. The post position refers to the stall in the starting gate that the horse will be breaking from to begin the race. If the post position is double digits, you will use the last digit. Example of a Winning Square: The horse in Post Position 8 wins the race. The participant's name beside the number 8 would be the winner. If you would like to have more than one winner per pool, you can use the top 2 or 3 finisher's post positions.